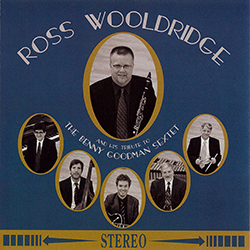 Critically acclaimed as one of Canada�s finest clarinet players, Ross Wooldridge and his Tribute to the Benny Goodman Sextet is a recording that simply sparkles! Formed in 2005 for a special concert for radio station Jazz.FM, Ross and his group delight in playing the best of the best of Benny Goodman's groundbreaking sextet material from the 1930's and 40's. Listeners can look forward to hearing Don Thompson on vibes, Jesse Barksdale on guitar, Dan McErlain on piano, Chris Banks on bass and Glenn Anderson on drums. Recorded at an outdoor concert in 2010.